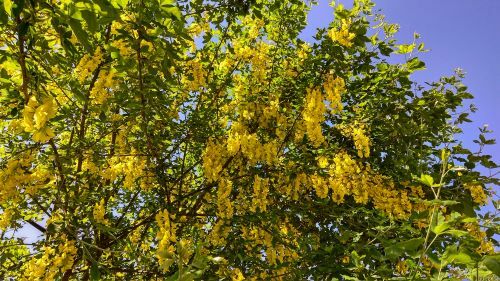 Fragrant trees can add a lot to your yard or garden because there is nothing like a pleasant scent to enhance the enjoyment of your surroundings. But if you’re looking for fragrant spring flowering trees, it’s important to understand that your perception of what a tree should be may not be particularly relevant to your search. It’s important to learn a little about the type of trees you’re interested in so that you achieve the beautiful aesthetic you’re dreaming of. For many people, the ideal tree they picture is a huge tree that towers over the property. However, when it comes to fragrant spring flowering trees, the best ones are the smaller specimens, because the taller a tree is, the farther up you have to go to get the full depth of its scent. Meanwhile, a smaller tree is closer to the ground, which maximizes the fragrance for those who are within reasonable proximity to it. That said, this doesn’t discount the value of taller shrubs. As it pertains to fragrant spring flowering trees, they essentially serve the same function as small trees, since your nose can easily absorb their aromas. You can also lower the way shrubs and vines will grow by removing lower branches, which expands the range in which the smell of the tree is strong. So which fragrant spring flowering tree is the best to suit your needs? That boils down to a matter of personal preference regarding fruit, foliage, color, and level of maintenance required. Here are five of our favorites. The beauty of apple trees is that, not only do they smell wonderful because of their fragrant flowers, but as long they are maintained properly, they also produce delicious edible fruit. You can also grow a wide variety of apple species to suit the particular taste and fragrance you prefer. It’s worth bearing in mind that the most popular apple tree is a Honeycrisp, which generally doesn’t grow beyond 15 feet tall and wide. Apple trees grow and thrive well in areas of full sunlight and typically bloom mid-season, so this should be kept in mind when planning when and where to plant an apple tree for the best possible results. These are beautiful trees, and they also smell incredible. However, these trees bloom fast in the spring and then tend to burn out quickly, rather than fade away gradually. You should keep this in mind if you decide to plant golden chains on your property, because the rapid nature of their rise and fall should lead to planning around their quick cycle. You’ll want to consider planting other trees that are ideally suited for seasons other than spring so that your yard has a strong landscape during every season. It’s worth noting that golden chains generally grow best in areas of partial sunlight and can reach between 15 and 25 feet high. They may also contain shrubs that reach up to 8 feet tall, which allows those shrubs to act in a similar manner to small trees if you maintain them properly. These trees smell fantastic and look like snow when their gorgeous white flowers bloom in the spring. While the flowers smell terrific and the tree has the word “apple” in its name, the tree itself doesn’t actually produce any fruit, which can be good or bad, depending on what your aim is. If you’re trying to avoid having a messy yard, then the ornamental crabapple tree is perfect for what you’re looking to accomplish. However, if you are trying to attract birds or grow delicious fruit that you can enjoy with your friends and family, then the crabapple tree is the exact opposite of what you would want, and you may want to consider a crabapple species that does produce fruit. The crabapple tree generally grows to a height of between 20 and 25 feet tall and matures best when planted in areas that get full sun. This is a tricky one because lilacs are technically shrubs not trees, but since everybody thinks of them as trees, they deserve to be discussed here. Traditional French lilacs have beautiful color and a very pleasant scent, and they can grow as high as 20 feet tall. The less traditional French lilacs tend to stay significantly shorter, though, along the range of 4 to 9 feet tall. So it really comes back to what you prefer aesthetically, as far as whether you are better off choosing a traditional or non-traditional French lilac. Keep in mind that because the aroma of the French lilac is so wonderful, you’ll probably want to do everything possible not to let it grow too tall—perhaps by pruning—so that the lovely fragrance isn’t too far from the reach of your nose. This is a tree whose fragrance will virtually never be missed because its scent never grows very far from your nose. That’s because the Canadian hemlock has a trait that makes it different from every other tree on this list: the Canadian hemlock does not flower. So where does its aroma come from? The origin of the Canadian hemlock’s lovely scent is the evergreen needles of its tree branches, which you can smell for years on end. This is a very good thing in the case of the Canadian hemlock because, unlike the other trees on this list, the Canadian hemlock can grow up to be 80 feet tall. While that may sound astounding, the fact that the fragrance comes from the evergreen needles of the branches means the height is not that important to the scent. However, if you find the height to be unmanageable and you want to keep it shorter, pruning the Canadian hemlock to keep it smaller is always an option. No matter which fragrant spring flowering tree you choose for your yard, keeping it healthy throughout its life span will require some care, be it pruning to keep the beautiful scent close to the ground or regular health checks and upkeep. Our certified arborists at Mr. Tree not only can provide advice on recommended tree care, but we can also provide the services that will keep your tree growing strong and smelling beautiful for a long time.